This the first time I try real trading experience in Octafx, with a no deposit welcome bonus, Octafx broker with a extremely advanced deal. This is very helpful for beginner traders with the bonus without any deposit. With that bonus amount, Profits can be withdrawal after comply with regulations. Lightweight Spread, micro account type 5 digits, so as to decrease losses and profits making. Octafx the broker, this is my best experience in forex trading. Thank you OctaFX. What I mostly like about OctaFX is that they provide true ECN/STP service and minimum deposit which is rare with many forex brokers. Actually, trading with an ECN/STP broker with low spread is an opportunity for scalpers. There are many brokers offer STP/ECN trading, but those require higher initial deposit than OctaFX. Another advantage is their almost instant trade execution. I quite often make withdrawals and I had a problem only once, my account had to be verified, but when I provided them with the relevant documents, the issue was solved and withdrawal was made (I heard that with other brokers this process could be very prolonged). The thing that brings me some sadness is that they do not have charting packages and trading signals, but on the whole they continue to develop, I always see their promotions and contests, very good way to attract new clients, I suppose. OctaFX is founded in 2011 with headquartered in Cedar Hill Crest, P.O. Villa, St. Vincent and the Grenadines. The company have a lot of winning awards such as “Best Broker Eastern Europe and Central Asia” from Forex Report Magazine, “Best ECN Broker Asia” from Global Banking and Finance Review, and many other. The type of this forex broker is ECN and give to their clients one of the best comfortable trading conditions, and also a lot of promotions. 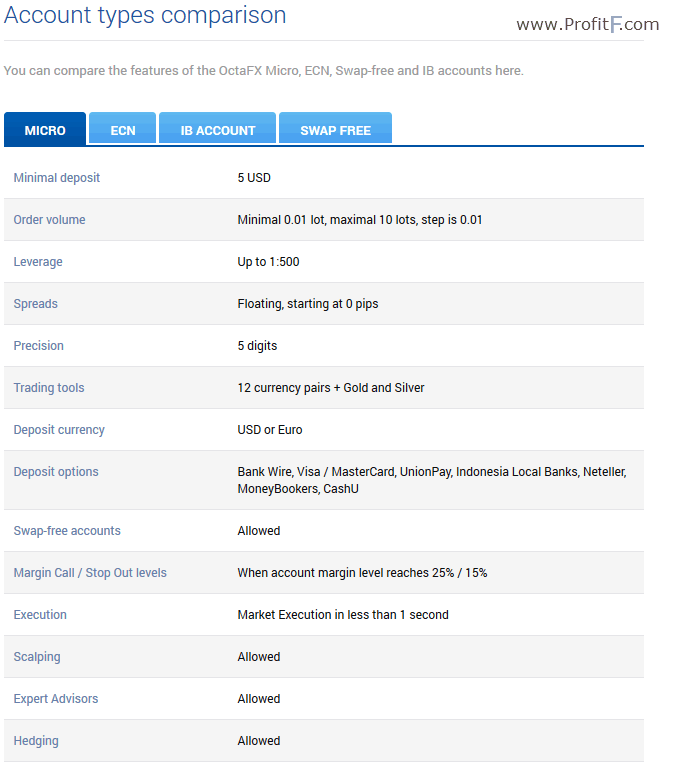 OctaFX minimum deposit is only $5 for Micro account and $50 for the other account types. You can use up to 1:500 leverage, you can trade over 20 currency pairs, Gold, Silver and other. Spreads are floating, starting at 0 pips depends on the currency pairs. You can deposit your money in USD and EUR with payments options such as Bank Wire, Visa / MasterCard, UnionPay, Neteller, MoneyBookers and CashU. Swap-free accounts(Islamic) is also allowed, so this company offer very good trading conditions for every traders such as scalpers, intraday traders, long-term investors, hedging and other. When you open your “Octa FX” account, you can trade from the charts and you will receive also market execution in less than 1 second, expert advisors, Market Commentary, e-mail alerts, signals, news, events, guaranteed stop loss and one-click execution. You can trade with your Mobile and also Web-Based Trading. MetaTrader 4 is the main platform where you can trade easily. They have affiliate programs and a lot of promotions demo contests, king of the road real contest and other. When you deposit money you will receive up to 50% bonus to your account! You just need to read their promotion rules.